When “is this silk okay” or “can I use dupioni” questions come up in forums and discussion groups, the go-to explanation is about the slubs. In the mid-nineteenth century slubby* silk was considered inferior. This is true. But, there are a couple more layers to it than that. There is the dupioni part of it and there is the inferior fabric part of it. Let’s look at the dupioni part first. A sample of dupioni. Notice the slubs in the weft threads. 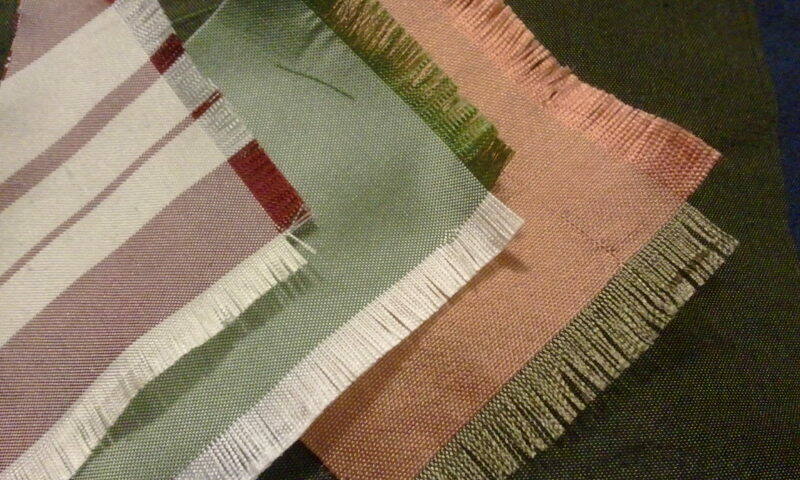 When frayed, see the difference between the finer warp threads and the uneven, thicker weft threads. 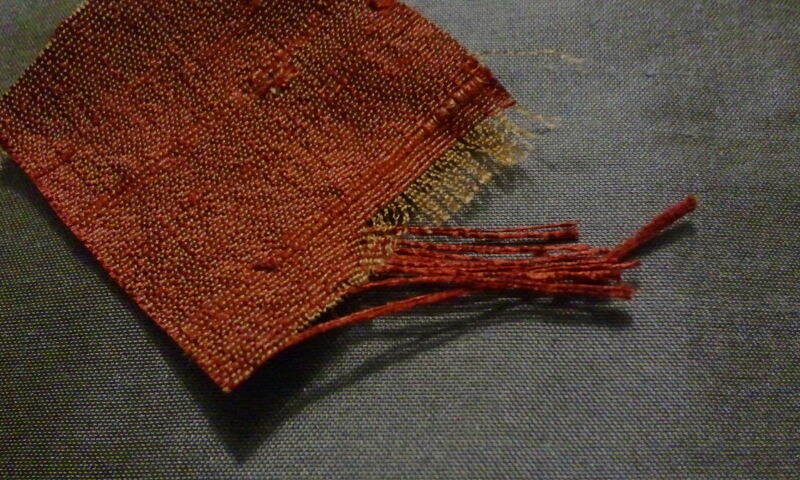 Dupioni is a plain weave silk. It uses two different types of thread though. In the warp, the threads that go up and down on a loom, the threads are fine with a tight twist. In the weft, the threads that go back and forth on a loom, the threads are loose, not tightly twisted. 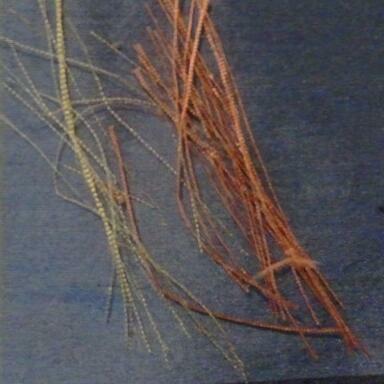 This weft thread is irregular, uneven and contains the cocoons of the silk caterpillars. Those cocoons are what make a dupioni fabric slubby. Beyond those slubs, those weft threads are also soft and fuzzy. 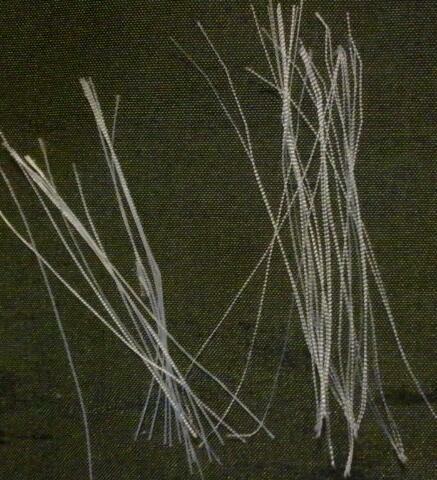 The weave of a dupioni silk unravels much easier than that of a taffeta. The unraveling is a fuzzy one, rather than a dangling long, fine thread of silk. Three silk samples, two taffetas on the left and one dupioni on the right. 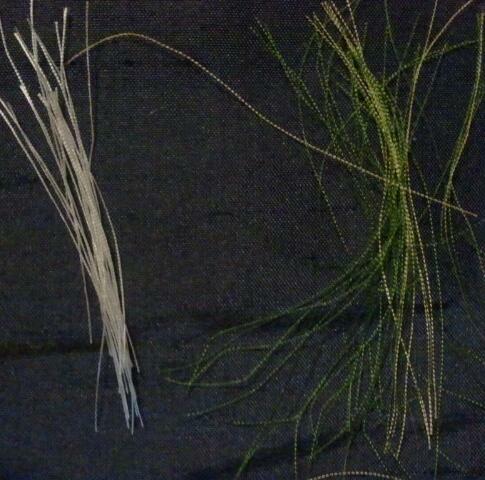 See the thread comparison below. Because, most modern interpreters are shooting for a taffeta, one of the most common silks used in the mid-nineteenth century for women’s clothing. Silk taffeta is also a plain weave fabric. It uses fine, tightly twisted silk threads for both the warp and the weft. Taffeta (that meant for clothing) has a full drape but retains an airiness because it is light weight. Taffeta will also crease sharply when asked and retain shaping. When we compare the two fabrics, dupioni is heavier, it drapes fully but with a bit of cave due to the weight, it also tends to be thicker due to the weft threads being uneven. Dupioni will not hold a crease or particular shaping like taffeta. In the end, even if a dupioni has little to no slubs, it still retains the unruly weft threads. Now, on to the inferior silks part. Inferior silks did exist in the mid-nineteenth century. We wouldn’t hear about them otherwise. So, the questions are – What were inferior silks? and What were actually done with them? To get a full understanding of inferior silks, there is plenty to read in Google Books. To stick with the basics… Inferior silk can start with the fiber itself as it comes out of the cocoon. Inferior silk can be so at the spinning stage as well. Shorter fibers and uneven fibers in a strand or in a thread make for an inferior silk since the ideal was fine, even and smooth. Many manufactures used those inferior fibers and threads for the tram, the filling or thicker cords that make the ribs in ribbed fabrics and ribbons (think grosgrain, bengaline and faile.) Some inferior threads were used for knitting stockings. In terms of the silk fabrics themselves, textile dictionaries refer to specific fabrics as coarse or rough. While these fabrics did in some cases become materials of fashion late in the century, during the mid-century they were not the ideal as they did not offer the drape and shaping needed for the style of the era. In some domestic guide books there are sections on how to select goods while shopping. I am trying to recall which one it is that goes into silk, discussing how to determine a silk’s quality. As soon as I remember which it is, I will include it. Until then, the existence of the passage tells us inferior, or at least lesser quality silk fabrics did make it into stores. It can be deduced that there was a manufacturing <> economic factor to all of this. So, in end…. Dupioni is slubby. But, the un-desirableness to the fabric goes beyond the slubs. The taffeta threads are both find and spun. Even though this silk, which is a shot silk, has two different color threads in two different thicknesses, all three thread (white, green and yellow) are even, fine and spun with a twist. *btw – What we call “Slubs” were known as Slugs, Nubs, Nibs and Knots in the nineteenth century. ADDING: Jessamyn mentioned the difference between between dupioni and shantung in a comment on FB. I thought I should add a link to this modern article on “How to tell the difference between silk dupioni and shantung.” If you have seen my plaid 50s dress with the big sleeves, that is shantung.